Since April 2012, the Reserve Bank of India (RBI) reduced the repo rate on 11 occasions. Repo rate is the rate at which RBI lends money to banks for short periods, when the latter face shortage of funds. While you might have cheered the fall hoping that the interest rates that you pay on your home loan will also drop, the actual impact on the ground would have left you disappointed. This is because even as you bring home a floating rate, which ideally should go up and down with the interest rate movement, the transmissions have not been transparent enough as home loan rates haven’t become cheaper by the proportion of fall in RBI rates or not fallen at all. But it’s not just you who realised this. Even RBI noticed this and moved from one form of interest rate pricing to another form over the years in order to make rate transmission more transparent. Most recently, in 2016, RBI moved the new loans from base rate to marginal cost of funds-based lending rate or MCLR. In another attempt to improve transparency in loan pricing, RBI has now said that all new retail and small business loans with floating rates, taken on or after 1 April 2019, will have to be benchmarked against external benchmarks. Banks are free to decide on the external benchmark—it could be RBI’s policy repo rate, 91-day treasury bill yield, 182-day treasury bill yield or any other benchmark market interest rate produced by Financial Benchmarks India Pvt. Ltd (FBIL). Read more on the announcement. We take a look at why this has happened, how it can impact you. It has been a concern even earlier that loan pricing is not transparent and transmission to retail borrowers doesn’t happen completely. This also means that when interest rates go up, they don’t come down easily for loans, but deposit rates are sticky at lower levels, so when the rates increase deposits rates don't increase proportionately. A study done by Care Ratings Ltd, titled Impact of RBI’s Rate Change on Scheduled Commercial Banks’ Interest Rates, confirmed these experiences in August 2018. Other than the most recent policy announcements, in the previous instances, banks raised lending rates faster than they raised deposit rates. Worse, the study found that in four out of six instances, banks hiked deposit rates by a smaller margin than they raised lending rates. 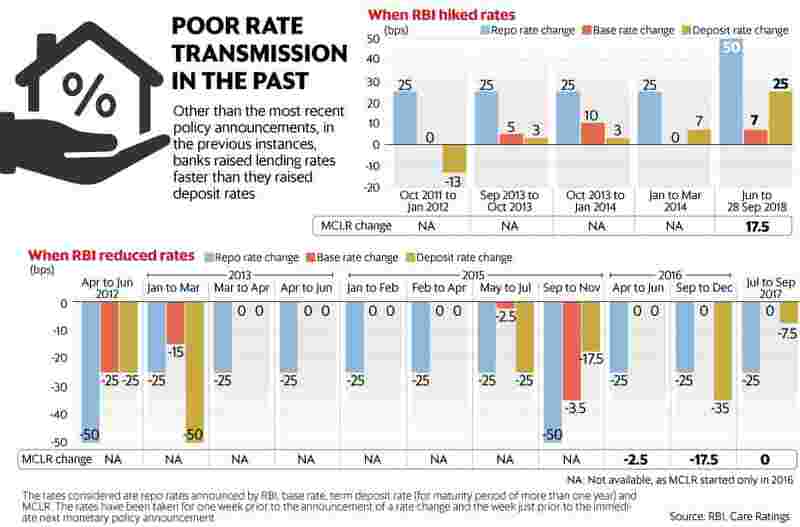 Then, there have been 11 instances in the past six years when RBI decreased interest rates. On five occasions, banks did not react in terms of transmitting interest rate benefit to borrowers. On two occasions, banks did not reduce base rates, but cut deposit rates (see graph). Hence, there have been valid consumer complaints on this front. RBI’s latest measure is likely to improve transparency in transmission as well as pricing. As per the new rule, for which detailed guidelines are awaited, the new loans will be benchmarked directly against repo rate, or 91- or 182-day treasury bills yield or any other external benchmark or any benchmark market interest rate produced by FBIL. Banks will be allowed to charge a spread over the benchmark rate. At present, in case of floating rate loans like home loans, banks arrive at the applicable rate of interest to a borrower based on MCLR. The effective rate is MCLR plus a spread. The spread is decided based on the credit profile of a borrower. While banks have to announce MCLR each month and cannot lend below that rate, they are free to determine the spread for a customer. There is no cap on the spread. Some banks even come out with promotional offers for such borrowers and offer loans at MCLR itself. Even in the new system, the banks will be allowed to charge a spread over the external benchmark rate. 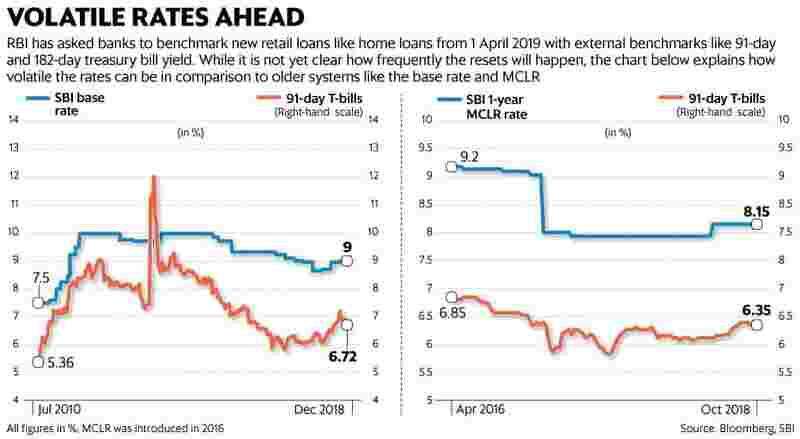 So even if the benchmark rate, for instance of a 91-day treasury bill yield is at 7% and MCLR is at 8.5%, the bank can decide to charge a spread of 250 basis points (bps) in the new system instead of a 100 bps spread in the MCLR-based system. There are no caps in either system. “I don’t think there will be any impact on that. I don’t think the rate for a borrower will be different than what it is at present. The intention of RBI seems to be to address the concern that the monetary policy transmission appears to be delayed," said P.K. Gupta, managing director, State Bank of India (SBI). In other words, for a new borrower, banks are expected to charge the same interest rate under the new system that they would be charging under the MCLR-based system. However, the difference would be felt by borrowers in subsequent years. “Only the benchmark is changing and you are taking a rate that is more market oriented than the base rate or MCLR that does not change often. But as a borrower I am more likely to get the benefit of market movements when rates fall, and loss when rates go up," said Madan Sabnavis, chief economist at CARE Ratings. Hence, not just banks, but even borrowers will face the risk of volatility in interest rates. At the same time, it will need to be seen what reset mechanism banks will adopt for new loans. At present, MCLR-linked loans are mostly reset once in a year. “If it is going to be on a monthly basis or a shorter frequency, it will be chaotic. While the programming will take care of it, but for everyone, budgeting will go for a toss with that," Sabnavis said. Typically, lending rates are linked to a bank’s cost of funds and hence deposit rates. Banks increase their deposit rates before increasing lending rates. So if the effective lending rate is about to change, change in deposit rates before that is likely. But the lending rate is unlikely to change at the starting point of a loan. Moreover, the new system of loans will be applicable only on incremental or new retail loans that have a floating rate of interest. “Such loans could only make up about 2-3% of the bank’s loan book," said Asutosh Mishra, head of research, institutional equity, Ashika Stock Broking. Deposits usually tend to be benchmarked with the repo rate and are further based on competition, Sabnavis said. “The only time when banks change deposit rates is when they require more funds from households. That happens when the demand for credit goes up and commensurate deposits don’t go up. Deposits don’t have a concept of a variable deposit rates structure. Banks can change interest rates in new deposits or renewals," he said. While a customer’s credit score plays a role even at present when she goes to take a loan, its importance might increase with the new system. At present, the spread that a bank charges to a customer above MCLR remains constant over the loan tenure. Under the new system, the bank can start looking at changing the spread even after the loan has been sanctioned, if the score of a borrower improves or deteriorates significantly. “That will be a new thing, but that is just an option available to the banks. I am not sure it will get implemented straightaway," Gupta said. In reality, what happens is that if somebody’s credit profile improves and that person can get a loan at a better rate from another bank, the person shifts to the other bank, he added. Important aspects like reset period of new loans and the benchmark banks decide to use are yet to emerge. More clarity will emerge when RBI comes out with its detailed guidelines later this month. A mechanism to shift to the new system can also be expected just like moving from base rate to MCLR was allowed when MCLR was introduced. One thing that is assured for now is that transparency in loan pricing will improve. However, that might be at the cost of increased volatility in the rates. Watch this space for more on this.